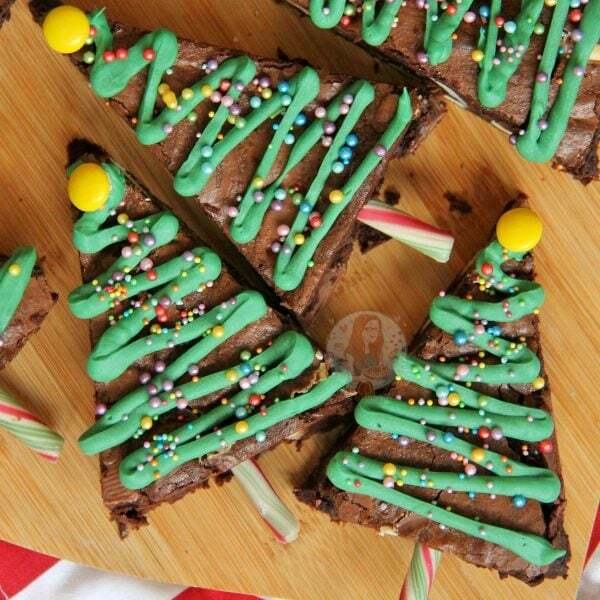 Chocolatey & Delicious Triple Chocolate Brownies in the shape of Christmas Trees – perfect for the festive season! Using an electric whisk/stand mixer, whisk together the Eggs & Caster Sugar for a few minutes until the colour has turned pale, is very mousse-like, and is double the original volume of the amount of eggs + sugar! You will know it's done because when you lift the whisk up out of the mix it should leave a trail for a couple of seconds before disappearing! When whisked, pour the cooled chocolate mixture over eggs and fold together carefully. It might take some time, but be patient – you don’t want to knock out the air you made up on the previous step! Melt the Green Candy melts and drizzle over in a zig-zag, and then decorate with some sweets/sprinkles! I used regular Candy Canes and snapped the tops off so that I just used the straight part – I used the off cuts of the candy canes in my Christmas Bark! I buy my Candy Melts in the local cake shop near me – but you can easily just use White Chocolate mixed with green food colouring! The White Chocolate will be thinner though! These will last in an airtight container for 1 week, but will make excellent little gifts this Christmas! This recipe was originally based on BBC Good Food recipe with my own changes and decoration!